Edge computing is an approach of optimizing cloud computing systems by removing data processing from the cloud and performing it at the network Edge, much nearer to the source of data. This in turn can help to streamline the flow of local traffic to a cloud server as well as enable data to be analysed in real-time within the edge devices themselves. The ability to capture insights from data in real-time, with potentially no latency issues is disrupting many industries and offering great benefits to companies and consumers. In this article, we’ll be looking at five different use case examples of Edge Computing Solutions in use today. So, let’s jump straight in! Smart Grid, as we know, is essentially the concept of establishing a two way communication between distribution infrastructure, consumer and the utility head end using Internet Protocol. 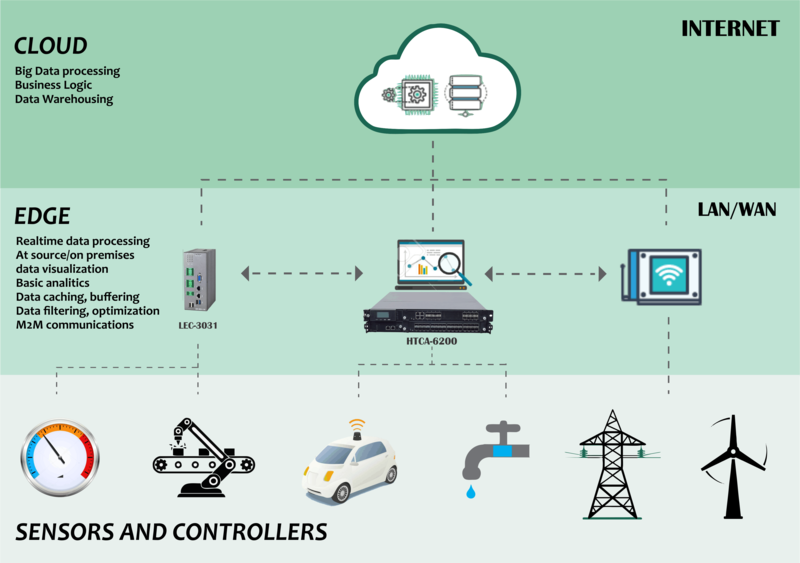 Fast developing industrial IoT landscape is offering a number of technologies to monitor, manage and control a variety of functions within an electric grid’s distribution infrastructure. With an increasing emphasis on moving from fossil fuel to distributed renewable energy resources for cost and operational efficiency benefits, power grids are challenged with quickly embracing ways to integrate all resources that can generate electricity and contribute to its existing distribution network. Grid Edge computing solutions are helping the utilities monitor and analyse these additional renewable power generating resources integrated into their grid, in real time. This is something legacy SCADA systems are unable to offer. From residential rooftop solar to solar farms, commercial solar, electric vehicles and wind farms, smart meters are generating a ton of data that helps utilities to view the amount of energy available and required, allowing their demand response to become more efficient, avoid peaks and reduce costs. This data is first processed in the Grid Edge Controllers that perform local computation and analysis of the data only send necessary actionable information over a wireless network to the Utility. Grid Edge Controllers are intelligent servers deployed as an interface between the edge nodes and the utility’s core network. Safety monitoring within critical infrastructure such as oil and gas utilities is of the upmost importance. For this reason, many cutting edge IoT monitoring devices are being deployed in order to safeguard against disaster. Using Internet of Things devices such as temperature, humidity, pressure, and moisture sensors, alongside internet protocol (IP) cameras and other technologies, oil and gas monitoring operations produce an immense amount of data in order to provide key insights into the health of their specific systems. Edge computing allows data to be analysed, processed, and then delivered to end-users in real-time, allowing for control centers to access data as it occurs in order to foresee and prevent malfunctions or incidents before they occur. As, when dealing with critical infrastructure such as oil and gas or other energy services, any failures within a particular system have the potential to be catastrophic and should always warrant the highest levels of precaution. Edge video orchestration utilises mobile edge computing, or MEC, in order to deliver video traffic directly to users, instead of running back and forth between a centralised core network. MEC-powered video orchestration is most useful in large public venues, such as sports stadiums or music arenas where it can be important for localised venue services such as live video streaming and data analytics. For example, video created during a soccer match could be provided to customers from a mobile edge computing server that was running the appropriate applications at the venue. Video traffic could then be streamed directly to customers in the form of services such as “player cams”. Currently, network operator EE is investigating the potential for these types of services in collaboration with Wembley Stadium, the national soccer stadium of the UK. Intelligent transportation systems, particularly those with a traffic management focus, are another example of how edge computing solutions are being put into practice today. Due to the recent influx of IoT devices and sensors that are now being used for intelligent transportation and traffic management systems, huge amounts of data are gathered and require processing, however, only a selection of this data will actually be of any use. Edge computing is able to analyse and process data on the traffic hardware itself and filter out everything but what is needed so as to remove unnecessary traffic. This reduces the overall amount of data that needs to be transmitted across a given network and helps to reduce both operating and storage costs. While autonomous vehicles are not quite at a stage where they are being deployed en masse, edge computing technologies are so essential to autonomous vehicles that this mode of transport would be much more difficult, perhaps even impossible to achieve without them. Distributed Edge computing allows autonomous or driverless vehicles to host artificial intelligence (AI) applications at the network edge, helping to ensure the lowest possible latency levels between data being generated and then used to run a vehicle. Autonomous vehicles require, in order to run optimally, a huge amount of data to be produced, processed, and shared, and all of it to be done locally and in real-time. For exactly those reasons, autonomous vehicles are some of the most complex and cutting-edge deployments of edge computing technologies to date. The post 5 Examples of Edge Computing Solutions in Use Today appeared first on Lanner.